Hello, hello! 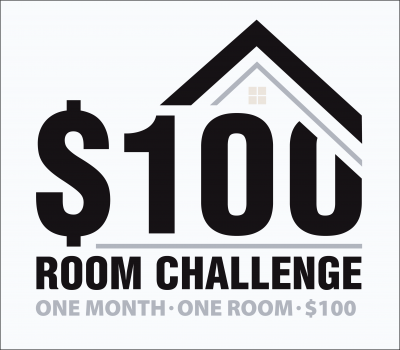 It’s Wednesday, and typically that means the start of another $100 Room Challenge, however, for the months of April and May, I am participating in the One Room Challenge hosted by Calling It Home. 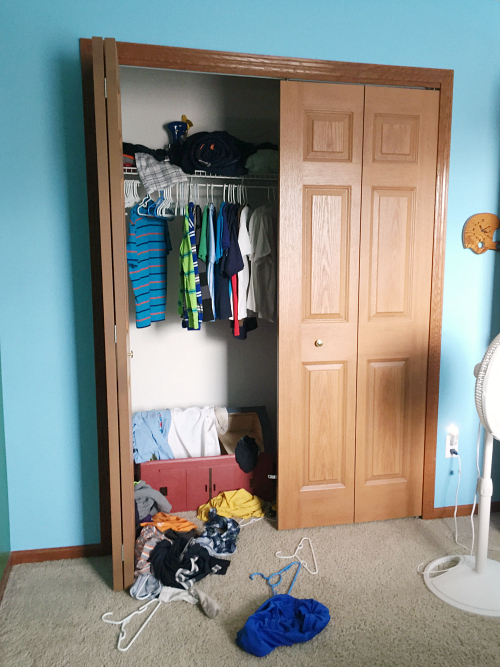 During Round 2 of this challenge, I was actually able to redo my laundry room within the $100 budget that I typically use for room transformations, however, this month I’m redoing my son’s bedroom (age 9) and he is in desperate need of a new dresser. (Not sure how that would pan out with only $100 to spend). I, however, will do my best to keep this challenge budget-friendly, as always. For those of you that are not familiar with the One Room Challenge, let me briefly explain. Twice a year, Linda (from the blog “Calling It Home”) hosts a challenge in which each participant has 6 weeks to completely transform one space in their homes. There are 20 “Featured Designers” and 150+ linking participants (that would be me). It’s a fun way to see a whole lot of before and afters, while following the journeys along the way. If you popped on over specifically for the One Room Challenge, welcome! The first time I participated in this challenge was in the Spring of 2015. The blog looked a lot different back then. Just a few weeks ago this blog got a major overhaul including a new name. 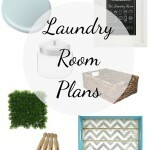 What was once “The Organized Life” is now “Lemons, Lavender, & Laundry”. For my first ORC, I worked on our powder room, and you can read more about it here. 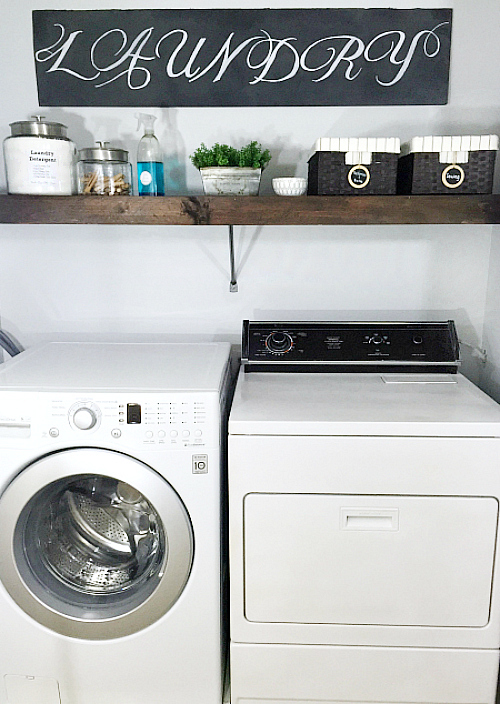 This past Fall, I redid our laundry room (and it’s still one of my favorite transformations)! For all the details, click here. This time around we’ve got a boy’s bedroom. My middle child is a huge football fan. He was literally in tears when the Vikings missed the field goal that would have advanced them in the playoffs. He knows more players than I do. (Okay. I only know, like, two… but still.) He knows the scores of Superbowls played years ago, and he collects football cards and reads football trivia. You get the picture. About three years ago, we decided we’d create a football themed room for him. 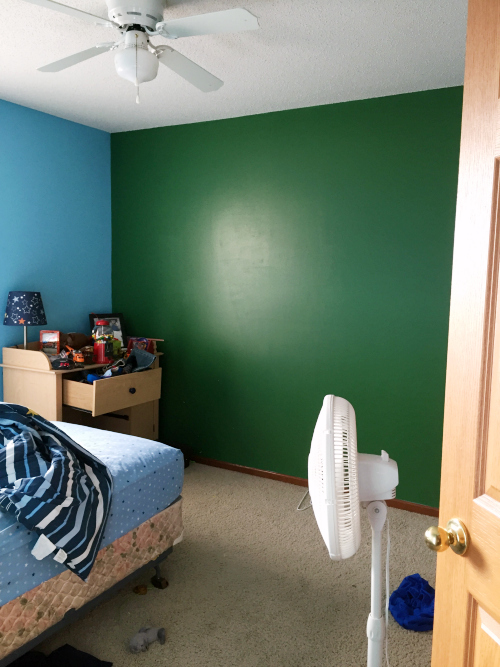 We painted one wall green in an effort to create a football field and that’s as far as we got. One green wall. Here’s the room in its current state. Please note that I am a firm believer in true “before shots”. I didn’t make the bed and put his pile of clothes neatly in his hamper. I didn’t tidy up his dresser and remove the pile of books from the floor. 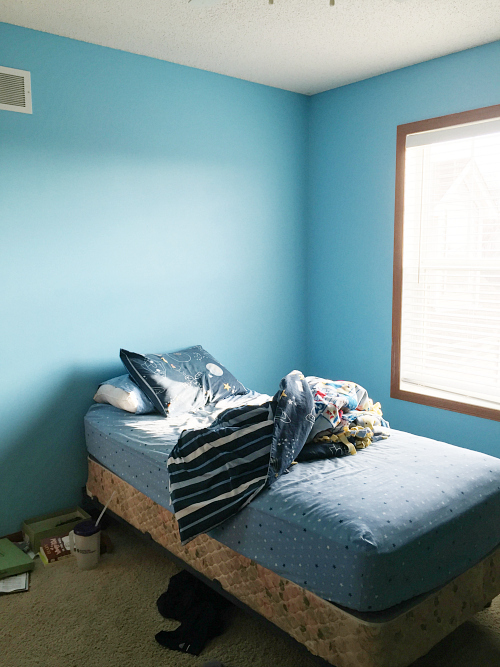 These are real life pictures of how his room tends to look… until I make him clean it. Next week I’ll be sharing all my plans for this space. If you are a fan of room transformations, you can find all the links to more challenges here (featured designers) and here (linking participants). 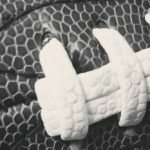 One Room Challenge: Are You Ready for Some Football? I’m just catching up, but it sounds like you have a great plan for this room! Can’t wait to see how it turns out. Thanks for kicking off this challenge. It really makes me finish a room that I would otherwise take months to complete. haha. Erin, you’ve left me in suspense! Are you keeping the football theme you intended for Isaac’s room? I guess I’ll just have to tune-in next week and find out. 🙂 Love the authentic real-life before photos too. I’m excited to follow along with your progress. We are definitely sticking to the football theme. It should be pretty exciting, and he’s SO ready for his room to be completed. I can’t wait to see what you end up doing with this space, with so many good ideas! What a fun challenge!! I love a challenge on a budget even more! Cheers to the ORC kickoff, mama! I love the challenge of working with a small budget. It forces me to be more creative. We’ll see how this one turns out. Thanks for stopping by, and good luck to you as you work on your bedroom! I’m excited to see your plans next week! I love true before pictures as well – it’s real life! I actually believe that the worse the before picture, the better the after picture. Why not just show it how it is? It’ll just look that much better afterwards! Yes! That is exactly what I need! Someone’s trash can become my treasure! Thank Maria! My poor son has been waiting SO long for his room to be done, and I’m excited to finally GET it done. Nothing like a quick 6 week challenge to give me the motivation I need! If you saw my post, you’ll know that I know exactly what you mean about the before shots. But, my husband is the really messy one! Can’t wait to see the transformation! Thanks Nicole! I’m loving our master bedroom so much! So much brighter in there now. I’m definitely one that likes the challenge of a tight budget. We’ll see how this one turns out. If the paint job is still in good shape, I would keep it. The colors you chose before are glowing. I saw a product advertised that is a transparent chalkboard paint. 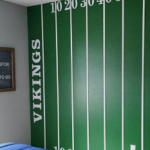 While you might finally get around to putting in yard lines and such, a transparent chalkboard layer on the green wall would allow your son and his friends to design plays of their own, and review plays from games they see. In my city, we have a fb site called “Free in Mesquite” where people list things they have to give away and others list In Search Of or In Need Of items they would like to find for free. The purpose is to keep things recycling instead of being trashed. All the surrounding areas have the same kind of site. Also, we have many thrift stores that don’t treat furniture like antiques, and certain Salvation Army and Goodwill stores in our area carry used furniture, but not all of them. My church also has a public, open fb page where people can list jobs, items for sale or free, and other announcements somebody in town might be interested in, even if they don’t go to our church. Just another resource some of us use. Happy shopping, painting, building, or whatever you do. I’m marking my calendar for six weeks so I don’t miss your reveal. I LOVE your idea for the transparent chalkboard paint. I didn’t know that existed. I will definitely look into it. I am actually a part of 3 Facebook groups that post items for sale/free, so I’ll be checking those for the dresser. Thanks for all your ideas! Love them! 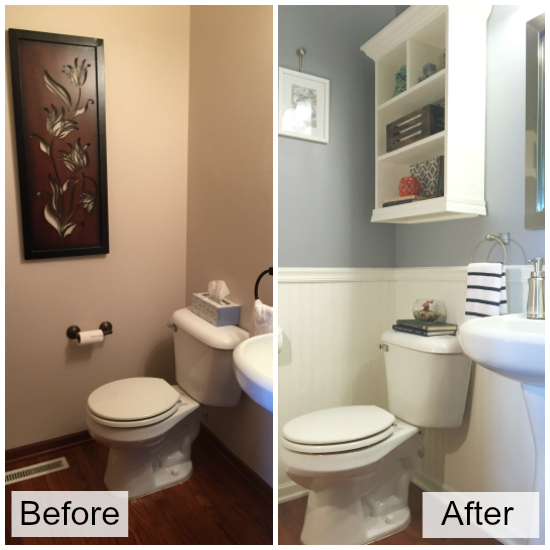 Erin, I’m still in awe in how great your bathroom makeover turned out for such a budget friendly price tag! Good luck on this room, kid’s spaces are my favorite to work on! Well… that bathroom was done before the $100 Room Challenges began, so that room cost more like $500, but I love trying to work with a tight budget. It forces me to think WAY outside the box 🙂 Good luck to you as you work on your office! Loved your previous makeovers and can’t wait to see what you have planned for in here! I love that you are combining your 100 room challenge with the ORC! I cant wait to see how it turns out! 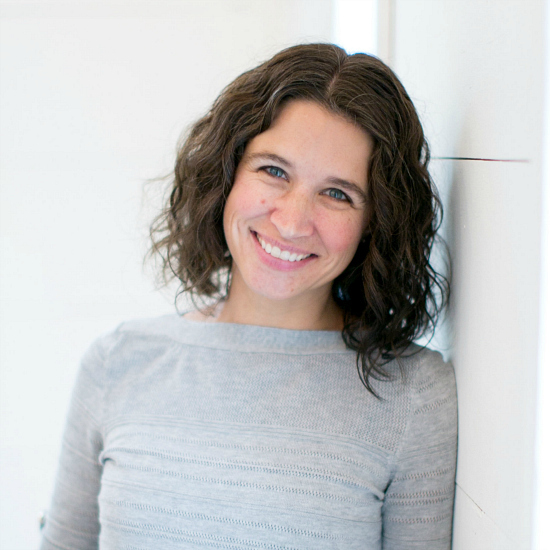 Erin – this is so exciting for your son! We can’t wait to see how the room progresses! Best wishes. Every time I redo a room, it tends to become my favorite. Hopefully this one will not disappoint. I’m excited to get started. I cannot wait to see the kitchen you’re doing!!! Go Vikings!!! I might have been in tears right along with him (I’m Minnesota born!). Can’t wait to see how you transform this space. Gotta love Minnesota… except during the months of January and February. That’s when we should all fly south. Looks great, can’t wait to see how it goes! Thanks Michaela! I can’t wait to see your outdoor space as well. These challenges are always so fun! You and me both. I’m pretty sure my trip to Costco for puppy food was my ONLY productive moment today. Otherwise, I’ve been checking out the ORC spaces. My kids get home from school in about 3 minutes, so I’ll need to tear myself away. ooo excited to see the updates! good luck! Thanks Lianna! Kid spaces are always fun to work with. I loved your kids’ bathroom last season. Kids spaces are SO fun because you can add a little more whimsy and fun elements. Excited to see what you decide to do this round! Excited to see your plans for the space! These challenges are always so fun. I love that so many of us participate and cheer each other on. Good luck to you as you conquer your bathroom! $100 renovation! So amazing! One of my biggest problems with design in general is how expensive it is. I can’t afford all those $400 items! ha! Anyway, I am super excited to see what you do. I do like that green wall, I got to say. This is my firs ORC. I am nervous and excited. This is all I can think about! There are a lot of first timers this round. It’s such a fun challenge. No need to be nervous. There is SO much support and encouragement along the way. I’m just now going through the spaces over at Calling It Home. I’ll be sure to stop over and check out what you’re up to! Good luck! Hey Erin! Your boy sounds like a real cutie pie! I’m excited to see your transformation of his space!! Isaac is pretty excited to FINALLY get his room done since we’ve been telling him for years that we were going to do something with it. Hopefully he loves the end result! I love seeing all of your $100 room challenges! I’m attempting my first ORC this year and it’s going to be a budget friendly (kid’s homework area) re-do, so I’ll be looking forward to following YOUR budget friendly re-do too. Looking great! The ORCs are SO fun. 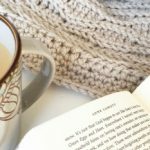 It’s great motivation and there are wonderful bloggers encouraging you along the way. Just got the kiddos off to school, so I’ll be checking out what others are doing soon! Good luck! Hey Kristin- Sorry to reply to you twice. I checked out your ORC space but was unable to comment on your post, so I thought I’d let you know that I am LOVING your ideas for the homework space. I cannot imagine what anyone could possibly do with all that glass shelving 🙂 Can’t wait to follow your progress!